Gumdrop’s Hideaway case for the new Apple iPad Pro 12.9 combines our classic impact resistant dual-layer silicone/polycarbonate design and a built-in, multi-angle Hideaway stand. This unique combination of technology and performance brings the best of both worlds together into a rugged long-term solution that will not let you down in extreme environments. From your office to the work site, your home or the classroom... We’ve got you covered. The Hideaway for iPad Pro comes with super handy, dual-position, Apple Pencil pocket. The pocket keeps your pencil close at hand when you need to transition from typing to drawing and back again. The Hideaway stand conforms to your needs with a rugged built in stand that adjusts for two main modes: viewing and typing. The stand folds completely and securely away when not in use. 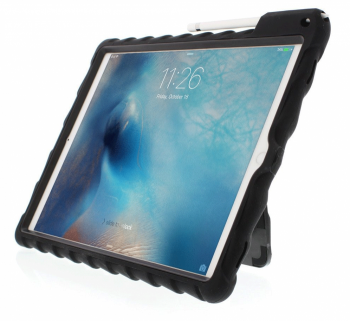 The Hideaway case for iPad Pro combines a ridged internal polycarbonate frame and an impact absorbing durable silicone external shell to provide rugged, dual-layer protection from drops, impacts and general back luck.